Ashwashila Capsule contains Ashwagandha and Shilajit. Both ingredients provide strength to the mind and body and improve non-specific immunity. Therapeutically, it is beneficial for fatigue, stress, physical debility, sexual weakness, joint pains, osteoarthritis, diabetic neuropathy and urinary disorders. Pharmacological Actions are based on its ingredients – Ashwagandha and Shilajit, which are mainly used for their adaptogen, aphrodisiac, and rejuvenating actions. Ashwashila Capsule has following medicinal properties. Ashwashila Capsule has USHNA (hot) potency. Both ingredients – Ashwagandha and Shilajit have TIKTA (Bitter), KATU (Pungent) taste and USHNA (hot) potency. Therefore, it is best suitable for increased or aggravated KAPHA & VATA Dosha. People with Vata disorders can take it along with warm milk. People with Kapha disorders can take it with warm water. However, Ashwagandha has anabolic action, which might also increase body weight. Shilajit benefits for losing weight. Therefore, both ingredients may counteract to balance the effects of each other in case of obesity, but when taken with warm water. Ashwashila Capsule is helpful in following health conditions. The main effects of Ashwashila Capsule appear on the brain, reproductive organs, muscles, and joints. It is beneficial neurological disorders, musculoskeletal disorders, and diseases of the reproductive system. There are several causes of fatigue. Ashwashila Capsule works well when you experience tiredness due to lack of sleep, lack of physical activity or excessive physical activity, anemia, anxiety, depression, diabetes, stress, and use of alcohol. It improves sleep and strengthens the body. Ashwashila Capsule is a combination of Shilajit and Ashwagandha, which makes it more potent and effective remedy for fatigue and chronic fatigue syndrome (CFS). Shilajit in Ashwashila acts like a supportive medicine for Ashwagandha and improves its anti-stress potential. Both Ashwagandha and Shilajit strengthen the muscles and improve endurance capacity of the body. 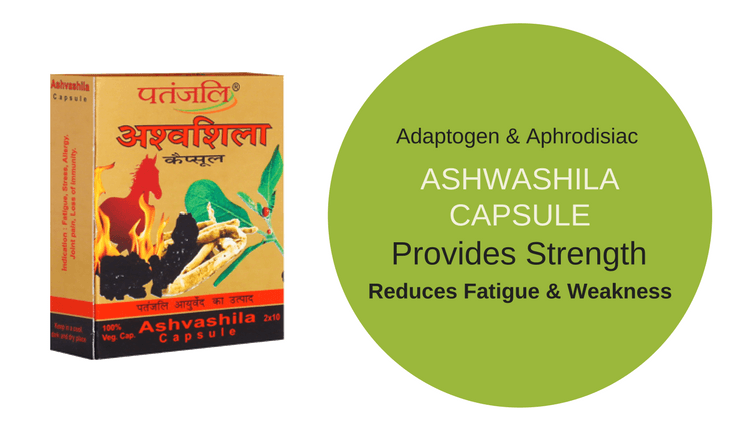 Therefore, Ashwashila Capsule reduces physical weakness. Ashwashila Capsule is a combination of both, so it is likely to be very effective for patients having low sperm count. ** The maximum dosage of Ashwashila Capsule is a general estimate. Ashwashila Capsule is LIKELY SAFE in the recommended dosage when taken under professional supervision. There are no absolute contraindications for Ashwashila Capsule. The safety profile of Ashwashila Capsule is not well established for pregnant women and lactating mothers. However, both ingredients are possibly safe during pregnancy and lactation. Consult an ayurvedic physician before using Ashwashila Capsule during pregnancy and lactation. Met with a freak accident and felling on my back. This happened at Noida in July, 2017. To recover from the back injury, consulted a Patanjali Chikitsalaya Vaidya. They prescribed 2 types of Guggulu, CP, and Ashwashila. Only two doses of Ashwashila in a day along with other prescribed medicines caused a severe haemorrhoid swelling and pain. Stopped Ashwashila, took nearly a month to recover from haemorrhoid pain. Sir, can you please let me know with all the described benefits of Ashwashila, why did my body developed the above conditions. How to consume Ashwashila to derive the positive benefits without any side effects. My body is nearly 67 years old, retired from money making work, spending more time in Prayers, Satsang, Selfunfoldment,Community activities. Sir, will you please oblige and respond.